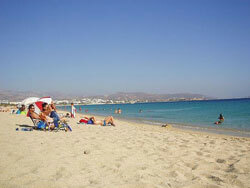 Opposite the health centre in Hora, there is a road which leads to the famous beaches of Agios Prokopis and Agia Anna. The road passes in front of the Naxos Airport, leaving Stelida’s hill behind on the right, and goes downhill coming to Agios Prokopis (5km from Hora) a famous tourist resort with plenty of shops covering all needs. 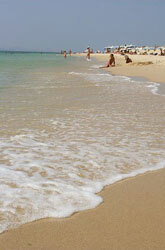 The sea is crystal clear and kilometers of a grained sandy beach hug the sheltered bay. Facilities for water sports are available. An important land mark is the salt lake, the «red lake» where often herons can be seen standing on its banks. The beach at Agia Anna is adjacent to that of Agios Prokopis; it is a huge beach divided in two parts by an attractive harbor and settlement with the same name as the beach, where the local fishing boats call in. A unique characteristic of this beach are the forests of cedar trees which thrive in the hot sand and provide shade for the swimmers. 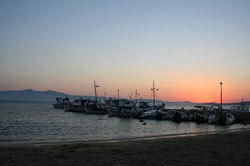 Agia Anna offers all the necessary facilities for tourists and has lots of different kinds of shops. There is a regular bus service from Hora to both Agia Anna and Agios Prokopis with buses running every half hour from early morning until late at night. From Agia Anna there is a passable country road which leads to the huge beach of Plaka. All along the Plaka beach there are hotels, rooms for rent, taverns and bars. Up to the beginning of the 80’s Plaka was popular with the hippies. Today it is peaceful and relaxing, with facilities for water sports.